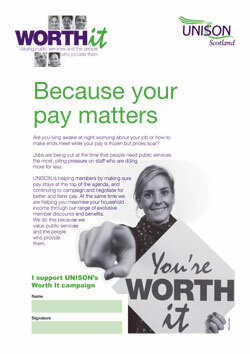 Worth It is UNISON’s UK-wide, cross service group campaign on pay. It aims to raise the profile of pay within the membership, with influencers and the wider public, and to find a new way of talking to people about the impact of the continued pay injustice - making pay about people. To do this, we need members to share their experiences and to show the real reasons why pay matters. We want to be able to illustrate the real-life experiences of public service workers in Scotland. To do this, we need to know your story. 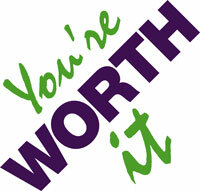 You pay your debts and you pay your rent. Mobile phone unfortunately is a necessity. I end up counting on my tax credit for the shopping. I'm a dedicated public sector worker, but I've been subject to a pay freeze and even a 1% pay rise this year hasn’t nearly matched the increased cost of living. I don’t have enough money to go to a restaurant or to treat myself or my kids sometimes. To add insult to injury, I've just found out that my electricity and gas bills will go up by 9.2%. This year we won’t have a holiday.